PTSD is most definitely a thing. After a sociopath or narcissistic abuser, we have it. Even if our friends or family don’t understand. Even if we don’t understand. PTSD stands for a post-traumatic stress disorder. PTSD isn’t permanent. It might surprise some of us that the range of swinging emotions and thoughts were going through is PTSD. 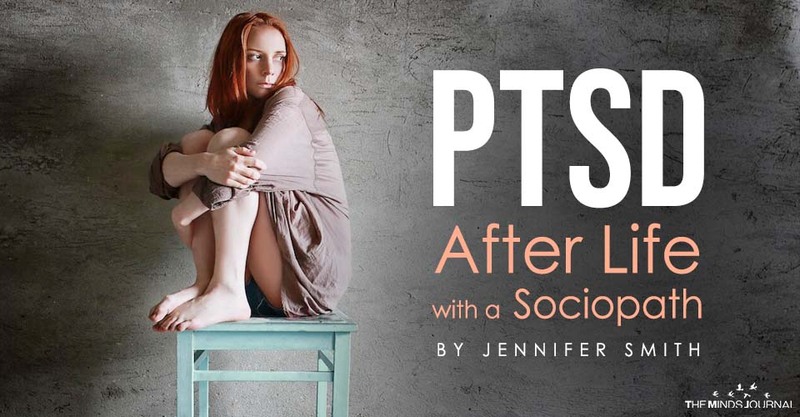 It may surprise our family or friends to realize that the pain, the terror, that broken feeling and all the weepy confusion is post-traumatic stress. PTSD is a thing after a sociopath or a narcissistic abuser. What we’re feeling is normal, unavoidable, not permanent and there are hope and healing. So many people around us tell us to: Move on. Or, Get over it. We try to do that, but somehow instead we can’t sleep, have lost weight, feel like we’ll never trust again and a whole bunch of other not great feelings, worries, and fears. Memories of this creep won’t stop. We’re so worn out of thinking about this loser, yet we can’t not think about this loser. – That’s normal. And it’s because we need answers to what the heck happened. Imagine we just got hit by a freight train, no one gets up and walks away from that without recovery. Here’s a tiny example of what PTSD is, think of this: Have you ever almost been in a car accident? Driving along normally and suddenly, there’s almost a mash-up? Then you keep driving, but tingles run through your hands, and they shake on the steering wheel, palms sweating, breathing shallow. Driving along because the traffic lights are green and we have somewhere to be, we try to act normally. But our heart pounds, our blood rushes, and images of what just happened run on a loop in our mind. Which is only partly there and is off on its own someplace kind of floaty and yet we feel sharply aware at the same time. Then, in the aftermath of nearly getting into a head on collision, our emotions keep swirling. Nearly as we feel all these emotions, the emotions turn to thoughts. We start forming ideas and thoughts and beliefs about what just happened immediately and quite naturally after the traumatic event. And, significantly, these ideas and thoughts and beliefs in our head are pulled from things we already “know” and “believe” about life and about ourselves. Hearing the word “sociopath” is only the beginning. That’s when recovery can begin. After the trauma of a hijacking by a sociopath, our emotions and thinking are all over the place because the trauma deregulates our nervous system. If we take in the effective methods of re-regulating our nervous system and other specific insights, we can fully recover.